Grave stele from Mycenae. 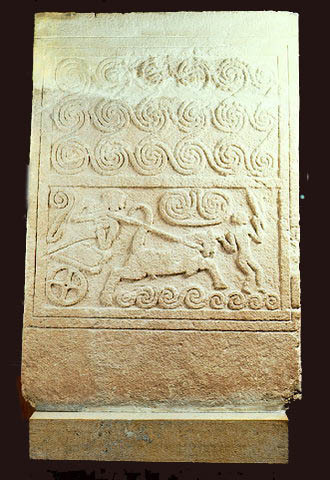 Funerary stele made of shelly sandstone, bearing the relief representation of a hunting or a fighting scene, including a chariot. It was found over Shaft Grave V of the Grave Circle A at Mycenae. Dated to the second half of the 16th century B.C. Inv. no. 1428.